Katherine Helenek holds a Master’s of Forensic Science specializing in Digital Forensics, Forensic Chemistry, and Crime Scene Investigation from Marshall University. She is an AccessData Certified Examiner (ACE) and a member of the Appalachian Institute of Digital Evidence (AIDE). She is now a Forensic Examiner with Digital Intelligence. Katherine is currently finishing up her first year as a forensic examiner for Digital Intelligence Forensic Services in New Berlin, WI. Digital Intelligence specializes in building FREDs, or Forensic Recovery of Evidence Devices, which are world-wide distributed forensic computers. She works on many different types of cases, but especially enjoys cell phone examinations. She makes it a point to learn as much as possible about mobile forensics- there’s still a lot out there she has left to learn and is eager to try and become as knowledgeable about the subject as possible. As she finishes up her first year, she has completed many of her goals: learning new tools, teaching others about certain forensic areas, examining digital forensic standards and protocols, and performing a complete forensic computer examination. Katherine still has many goals for her future in digital forensics- she is currently working towards her EnCE and would like to write more articles and possibly another book regarding digital forensics. She constantly learns new things from the Digital Forensic Senior Examiners and other Digital Intelligence employees. The most important goal to her, which is really a never-ending ambition, is to keep studying and learning from others in the field. For Katherine, each day is a new possibility to better herself and help others, not only in digital forensics, but in her community as well. To learn more about Digital Intelligence and the hardware and services that Katherine works with, you can visit the company website. In addition to her interest in cell phone examinations, Katherine recently authored a SciTech Connect blog post on the social media and the freedom of speech. In it, she examines where the line is drawn regarding what we are constitutionally free to post on our own social profiles. Read more of First Amendment or First Felony: Social Media and the Freedom of Speech. 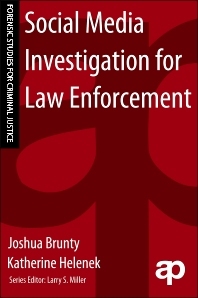 If you like what you’ve read so far, take a look at Social Media Investigation for Law Enforcement, a quick overview of digital forensic techniques for social media investigation, written by Katherine Helenek and Joshua Brunty.